It’s not a secret that websites allowing you to download software for free may pose a danger to your computer. If you’re downloading a program or an application from a non-reputable source, you’re running the risk of catching a virus or installing spyware. That’s why it’s crucial to know which websites can be trusted and which cannot. To spare you the bother of searching the web for relevant information, we have compiled the list of the most reliable and trustworthy free download online sources you can use safely. We suggest that you take a closer look at those sites right now. Softpedia is by far one of the largest online sources boasting the vastest collection of files. Most of the files available for download are updated on a daily basis. Most programs downloaded from the website in question are checked for viruses and malware. Thus, downloading a program from Softpedia, you can be sure that you’ll get a safe up-to-date product that will operate smoothly and seamlessly on your computer. The website’s user-friendly interface, in its turn, makes it easy for you to navigate through available downloads and chose whatever necessary. Softpedia’s trustworthiness score is also quite eloquent. As you may see, millions of users from different corners of the world have already appreciated its stability and reliability. So, if you want to download safely from the Internet, you should definitely opt for Softpedia. The outward appearance of MajorGeek may be misleading. Its interface looks a bit old-fashioned and not so pleasing to the eye. Still, we don’t normally look up free download websites to feast our eyes on. What we need from them are free and safe downloads that will make our digital life more comfortable and trouble-free. According to Rocket Files and other reputable online resources, MajorGeeks remains one of the most trusted download websites on the Internet. This source hosts thousands of files visitors download in bulk daily. It all makes MajorGeek worth a look. Ninite is arguably the most trusted free download source on the Internet. The site is famous for its huge database of downloadable files. You can quickly select a required file from the downloads list and make use of the custom installer file to download multiple files onto your computer. You can also use this file to install new files in bulk. Another website worth being mentioned on our list is FileHippo. This source boasts over twenty thousand downloadable files that are neatly categorized for your convenience. From this site, you can download applications from your Mac, Windows, or Linux device. Still, we suggest that you refrain from using a download manager or other similar tool the site may prompt you to download. You’d better skip this step and proceed with direct download. FileHippo offers Update Checker feature wherewith you can scan for outdated software and look for available updates. At first sight, there is nothing special about SnapFiles. Still, there is one feature that distinguishes it from the similar sources and makes it worth your attention. If you start checking SnapFile’s home page regularly, the odds are good that you’ll come across some really useful utility. 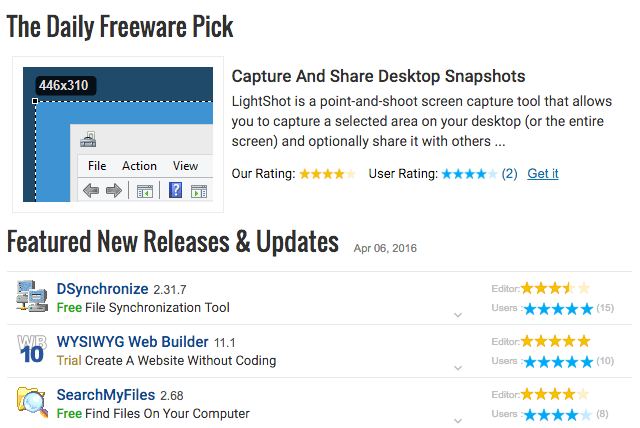 The point is that every day, the site releases their Daily Freeware Pick of software that, to their mind, may interest their visitors. Moreover, you can familiarize yourself with the user rating for this or that program, which may come in handy when you’re deciding whether or not to download it.